I was at a family funeral last week. Yes, a sad day. As my husband and I were getting into our car to join the procession to the cemetery, I grabbed a couple of bottles from the back seat and tucked them into the waiting arms of my little brother—the same little brother who is the sometimes giver and receiver of our birthday and Christmas gag gifts. I can’t decide if my favorite gift to him was the taxidermy frogs in a compromising position or the straight jacket. My favorite from him was the dead horse head in the bed. More than a couple of people saw this illicit-looking exchange, but only one man asked me what was in the bottles. Well, what could I say? 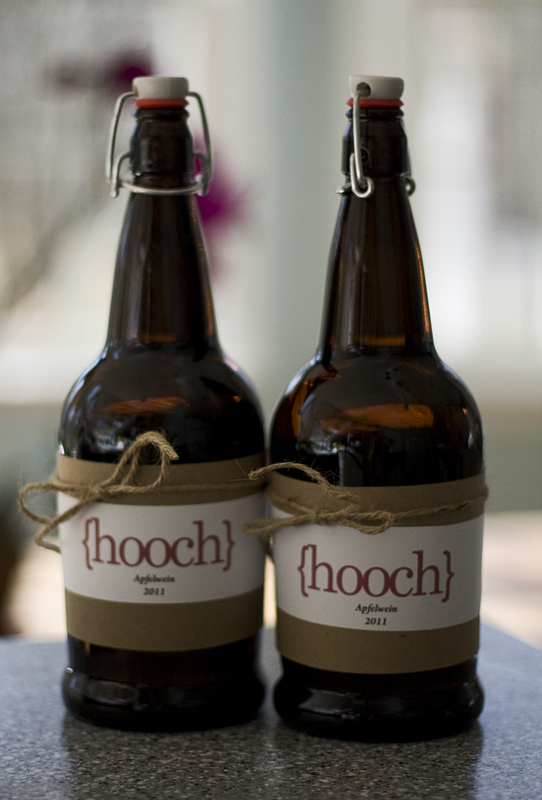 It was my homemade Hooch! Nothing to be ashamed of. We were in North Carolina, after all. It wasn’t difficult at all and only required apple juice, dextrose (corn sugar) and yeast. I mixed it all up and put it into a carboy with an air lock. 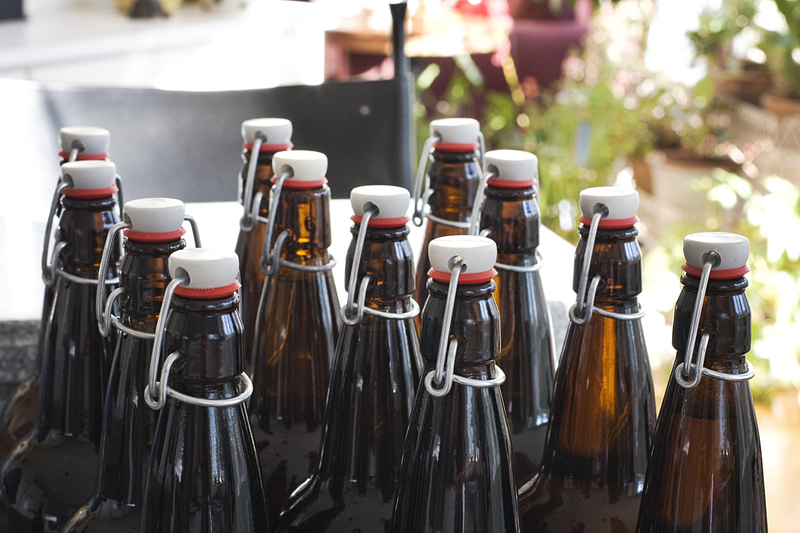 I stored it in the basement and waited patiently (procrastinated) for a year to bottle. And before bottling I added another two cups of corn sugar so that now it is a wonderful, apple-y, wine-y tasting brew. Surprisingly good! I’m not sure what’s next. I am emboldened by this apfelwein. That is, I’m emboldened by the success of this apfelwein, although it would also embolden me if I were drinking it right now. It does pack a little punch. I didn’t measure the alcohol content (a process that involves a hydrometer, two measurements of the specific gravity and a mathematical calculation). But it definitely earns the name Hooch. I’m not talking about some pathetic box of pre-made pancakes or a frozen Lean Cuisine. 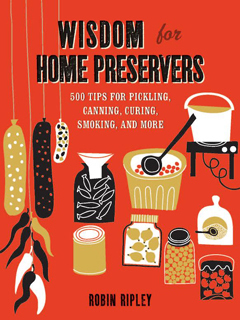 I’m talking about pantry staples, such as…well, such as crackers! At my local grocery store the cracker selection is, shall we say, minimalistic. There are the saltines, the Ritzes, the Triscuits. Beside them are a host of scary cracker combinations with ingredient lists that read like a foreign phone book. A gal with my taste for a crispy, savory, crackery treat is much disappointed. The offerings at places such as Whole Foods are better. In fact, my favorite store-bought cracker is Dr. Kracker. I’m in love with Dr. Kracker. (Don’t tell my husband.) The crackers I’m talking about are cellophane-wrapped in bundles of about eight crackers, heavy on the pumpkin seeds and cheese. I dream about these crackers. I will make these crackers someday because, much as I love him, it takes me an hour to get my Kracker fix. See, I live in the country and the nearest Whole Foods is an hour away. I’m on a quest to make the perfect cracker. I have read approximately 50 cracker recipes to understand cracker psychology. Yeast or no yeast? Cheese or no cheese? Seeds? Definitely. 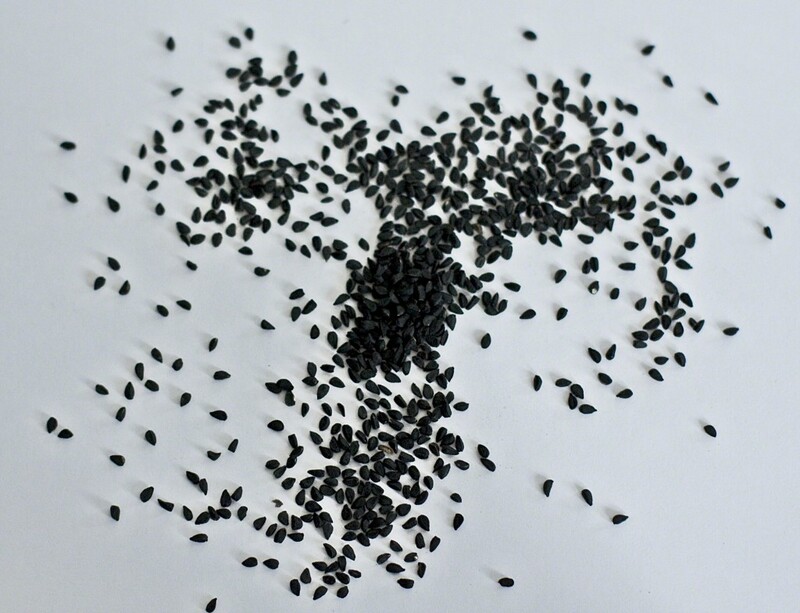 Do you like nigella seeds? No, they have nothing to do with that beautiful, buxom bombshell on the Food Network. I’m talking about the little triangle-shaped seeds used in Indian cooking. What? You don’t have them available at your local Piggly Wiggly? I don’t either. So I buy them from Penzy’s. This recipe is based on a recipe from Robert Sinskey Vineyards. 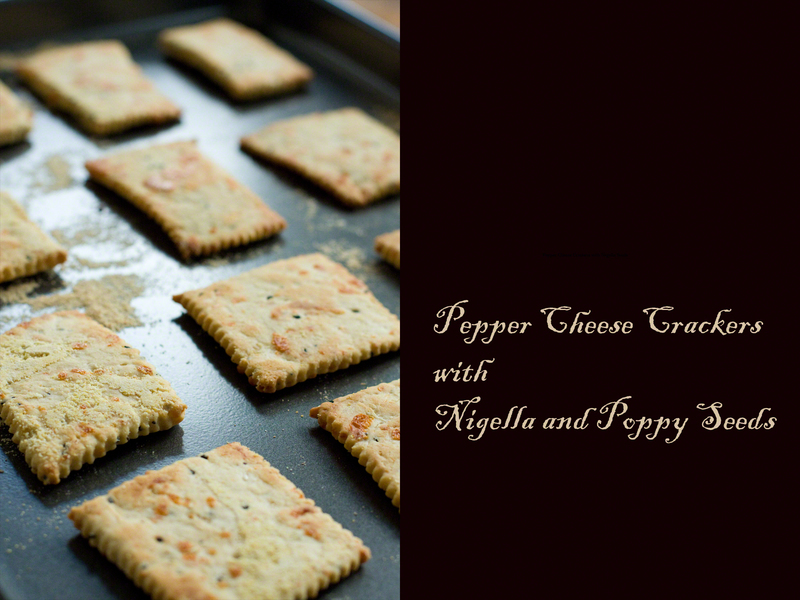 These crackers combine these wonderful, black, smokey nigella seeds with poppy seeds. And what’s a cracker without cheese, right? Throw some right in. Cracker making isn’t nearly as difficult as you might think. Set aside a couple of hours. Make yourself a nice glass of cinnamon iced tea. Turn on some music or an audio book and work away. Heck, you can even take a leisurely nap while the dough is rising. So give these Peppery Cheesy Crackers with Nigella and Poppy Seeds a whirl. 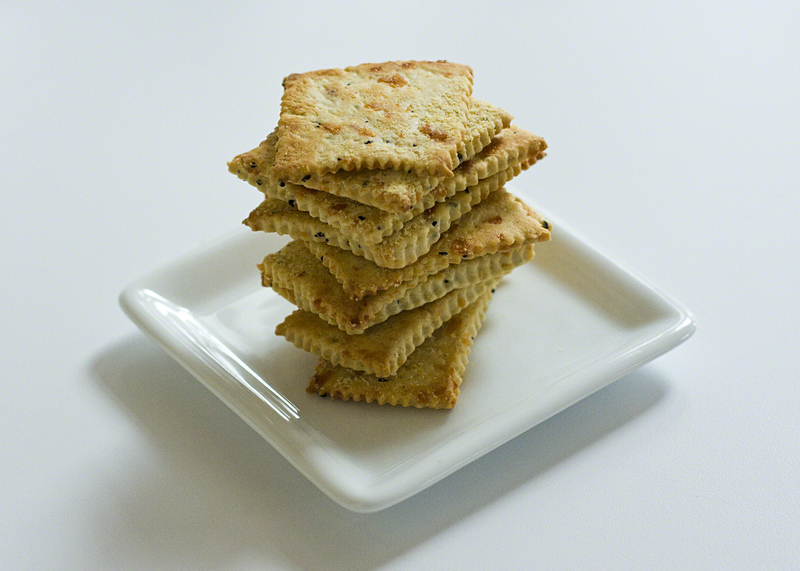 These crackers are wonderful with a roasted rustic tomato soup. They are also hearty enough to pair with an artichoke dip, baba ganouch or hummus. 1. Mix warm water and yeast in a small bowl and set aside for 5 minutes. 2. Mix flour into a stand mixing bowl equipped with a dough hook. Mix in yeast and water combination at low speed until the dough forms into a shaggy dough. 3. Add cheese, seeds and soft butter and pepper and continue kneading until the dough is a fairly cohesive, but not tight ball–about 5 minutes. 4. Gather dough into a ball with your hands and place into a large, very lightly oiled bowl. Place the bowl in a warm place and cover with a towel. 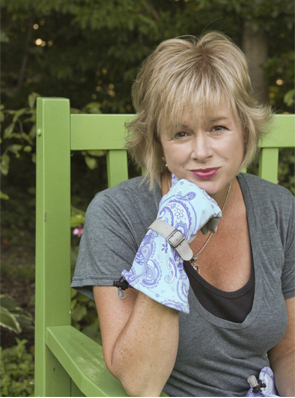 Because our house is fairly cool in the fall and winter, I often use a heating pad set on medium. Let rise for about 90 minutes. 6. Punch dough down. Divide into three working sections. Taking one section, roll it into a ball. Then, using a rolling pin, roll it out until fairly thin and about 10 – 12″ x 10 – 12″. There is no need to flour the work surface. Turn the dough over a couple of times to get an even sheet. Using a knife or decorative pastry cutter, trim the rolled-out sheet’s edges so you have a rectangle or square. Cut the rectangle/square into sections about three inches square. Gently transfer the pieces onto a baking sheet dusted lightly with corn meal. Brush lightly with olive oil and sprinkle with salt. 7. Bake the crackers for 8 to 10 minutes, flip and bake for another 8 to 10 minutes. The crackers should be golden brown and crisp. If not, cook until they are. 8. Cool crackers on a rack and proceed to work the remaining two pieces of dough in the same fashion. 9. Cool completely before storing in an air tight container.